Mobile ESPN is a Mobile Virtual Network Operator by ESPN which the the service is carried on the Sprint’s EvDO PowerVision mobile broadband wireless network. Currently Mobile EPSN offers Sanyo MVP and Samsung ACE cell phone handset for the sports fan. Mobile ESPN’s key feature is a Java-based sports application that can access news, real-time scores (frequently five or more seconds ahead of a television broadcast in updating scores), stats, highlights and headlines. Mobile ESPN also integrated with a SMS service where user is able to receive a text and video alert messages whenever the favorite five teams and 15 players scores or some other newsworthy event occurs. 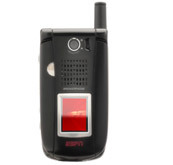 Mobile ESPN has variety of voice and data packages. 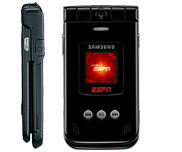 The handsets for Mobile ESPN are Sanyo MVP and Samsung ACE. Samsung ACE features built-in Bluetooth technology, 1.3 megapixel camera with built-in flash and digital zoom lens plus ability to captures video in up to 30-second intervals, 2.2″ 240×320 pixel 260,000 colors TFT screen, speakerphone, EVDO support, MP3/AAC music player and its size is 3.9 X 2.0 X 0.6 inches. Sanyo MVP features 2.1″ 260,000 colors QVGA (240×320 pixels) TFT display, EVDO high-speed data access support, 1.3 megapixel digital camera and camcorder with flash, MP3/AAC music player, 3D graphics, speakerphone and its size is 3.66 x 1.91 x 1.05 inches.